Donald Trump got three lowlife basketball players out of hot water in China. Now he’s whining that they didn’t thank him. But we should be whining that helped these entitled spoiled brats in the first place. What would you say if three Chinese nationals shoplifted sunglasses in Beverly Hills and we allowed them to leave the country without facing any justice? Well, that’s exactly what China was convinced to do by Donald Trump . . . and now, he’s expecting kudos for that. Instead, he deserves jeers. Follow Me on Twitter . . .
Do you think the three UCLA Basketball Players will say thank you President Trump? They were headed for 10 years in jail! 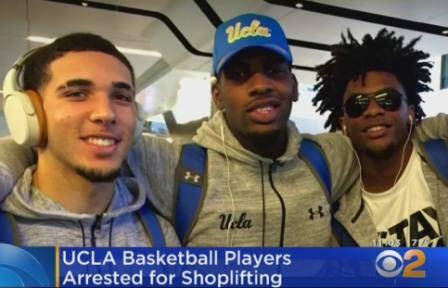 The three UCLA basketball players–LiAngelo Ball, Jalen Hill and Cody Riley–shoplifted sunglasses at the Louis Vuitton store (and two other stores!) in Hangzhou, China, last week. They were in China for a massive UCLA and college basketball marketing trip. I’m not sure why taxpayer dollars (UCLA is a publicly-funded university) must be wasted to “market” college basketball in a Communist country (or any foreign country), but that’s a topic for another column (though the NBA should’ve paid for the trip, since college basketball is the NBA’s free, tax-funded farm team system). Nobody ever accused college basketball players of being intellectual giants. But it should be basic common sense not to steal. The players should know that shoplifting is illegal in any country. Name me a country where it’s legal to steal from stores. I mean, don’t steal in a foreign country–especially Communist China–should be a no-brainer. Just as “don’t steal” in America should be a no-brainer. But these are spoiled brat, entitled college athletes who think they can do whatever they want without consequences. They don’t really have to study in college like real students (they have classes like Toothpick House Building 101 and Introductory Golf), don’t have to worry about paying for school or meals (they get all of this free), don’t have to engage in actual normal social behavior (mindless groupie girls throw themselves into bed with these fellow idiots), etc. They feel everything is owed to them, and they never have to work or try hard for anything. And, now, they haven’t had to try hard to get out of shoplifting in China, an act which anyone with two brain cells to rub together would know is a no-no. You go to a Communist country of your own free will, you’re a moron. You go to a Communist country and steal (at three different stores! ), you’re really a total imbecile. You taunted fate, and you deserve whatever happens to you, without our interference. I’ve written over and over again about the Americans who travel to Iran, Pakistan, Afghanistan, then-ISIS-controlled Syria and Iraq, and North Korea. They took their chances being idiots and traveling to these dangerous places where they knew the odds were high that bad stuff would happen. No reason for us to get in the way of these Darwin Award winners meeting natural selection. Sorry. Yeah, I know that the basketball players could have done up to 10 years hard labor jail time if they were convicted of shoplifting in China. But, so what? No tears from me. Nobody forced them to go to China. Nobody told them to go “shopping” at Louis Vuitton . . . AND at two other stores. And nobody put a gun to their heads to force them to steal . . . at ALL THREE stores. These were all choices they made freely. And they should’ve been forced to face some sort of punishment for their poor, willing choices. Instead, they were “held” in their luxury hotel. And that’s it. There have to be consequences for their actions. But there aren’t any. If Trump was going to waste political capital on these privileged thugs, he could’ve worked out a deal in which the three did at least a month or two of imprisonment to teach them a lesson–a lesson that they deserved and never got. On the contrary, they were taught that because of who they are, they will never have to face consequences of stupid, criminal behavior. Oh, and by the way–this is yet another example of “White Privilege!” since they are all Black. LiAngelo Ball, by the way, comes from a rich NBA family. I should feel sorry for him that he got caught shoplifting in China? Nope. But like they say, “Black Lives Matter.” Apparently, they mattered enough that American political capital was expended–no, wasted!–on them. And that’s my biggest problem with this whole deal. Contrast the three college hoops stars with the three Americans currently being held in North Korean prisons for baloney trumped-up “crimes.” My biggest objection is Trump’s waste of political capital with China on these three nothing basketball players a/k/a future multi-babydaddy bankruptcy filers. Yet, Tony Kim, Kim Hak Song, and Kim Dong Cul are all American and all stuck in North Korean prisons. They need Trump’s help. They need Trump’s influence on China to influence North Korea. But they won’t get it because they aren’t bigtime college athletes, which is the only reason the UCLA basketball stars got away with this and got to go home. If they were average American tourists to China, they’d do the time and Trump wouldn’t bother with them. Yes, nobody told the three Americans in North Korea to go there, and they knew the risks, just like the college b-ball players should have. But, they didn’t willingly engage in crime a la the hoopsters. One of them, Kim Hak Song, was in North Korea helping the starving North Korean people develop agricultural technology so they could efficiently grow their own food. Compare that with stealing sunglasses at Louis Vuitton . . . and two other stores from which they also stole. It simply doesn’t compare. And we need our political influence with China to leverage our debt with Chinese banks and to deal with North Korea’s growing nuclear and other military threats to the Western world, including South Korea. All of these are more laudable goals–infinitely more laudable and more important–than worrying about three childish, privileged college athlete thugs who felt they didn’t have to pay for sunglasses at a luxury store in China. As I said, at the very least, Donald Trump would have been performing a service to America in forcing them to stay in China for at least a few months. This would’ve made both Trump and the Chinese look like heroes. Instead, Trump is begging for Thank Yous from these three jerks on Twitter. Thank Yous from three privileged aholes whose next move will likely be kneeling during the National Anthem.